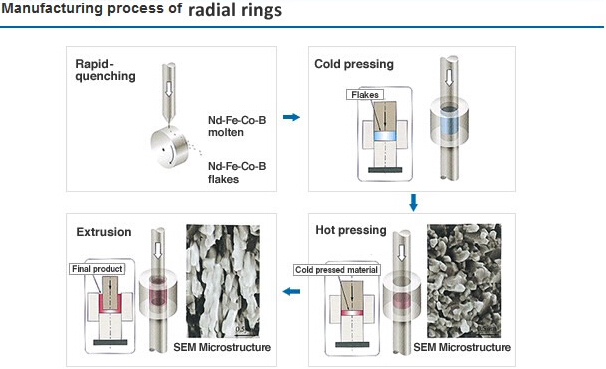 Radial Magnetization ring magnet is developed successfully based on the study of Sintered NdFeB rare earth permanent magnets in many years , and meets different requirements of permanent magnet servo motor, it is using the shaping method by new multipole radiation orientation, on the hypoxic conditions, it is through the research the compositions of NdFeB materials adapt raidal ring, as well as the phase structure, orientation forming, sintering and heat treatment process and the study of magnetizing method. The process of anisotropic radial magnetization ring magnet is stablility through batch testing, and suitable for industrial scale production, this innovative products achieve the same products abroad advanced level. The products of this project can be widely used in all kinds of permanent magnet servo motor, step motor, tachogenerators, have the remarkable economic and social benefits. The radial magnetization increases the ring’s magnetic force, thus creating the strongest NdFeb ring magnet available for industrial and commercial use. This momentous development is revolutionizing the magnet market, offering an innovative solution to a well-known need. Rings measure up to 150mm in diameter. Magnets are multi-poled - ring does not compromise the magnetic properties. AOMag stands at the frontline of this development, integrating it in new applications and enhancing performance. 1, Radial maximum energy product can reach 240 ~ 400kJ/m3 high magnetic. 2, It can be manufactured to facilitate bonding, the long dimension of the annular magnet assembly. 3, you can easily change the number of poles and the magnetic declination simply by the change of the magnetic coil. 4, Inner and outer circumferences monopole with magnetic as you required. 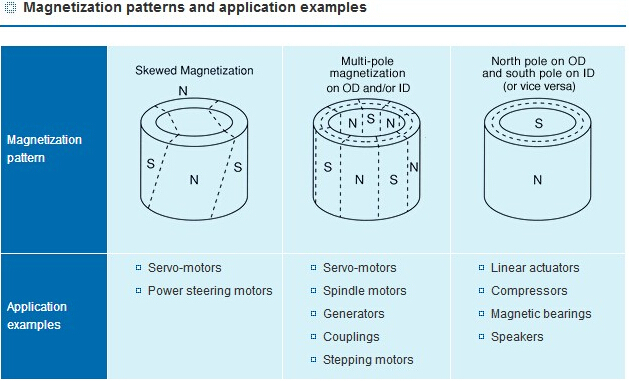 6 trails, thin-walled, long size (for example: the outer diameter of 5mm wall thickness of 0.5mm, length 80mm) contributes to the miniaturization of the motor. Up until recently, full magnetic rings (FMR) made of separate magnets conjoined together to create the desired ring shape, were the only solution for applications requiring circular-shaped multi-pole magnets.Now, a new technology powered by AOMag has enabled for the creation of a super strong, durable single-cast radially magnetized ring magnet.radiation ring magnet use for automotive electric power steering system, quiet, smooth sense of control, and easier to install. AC servo motor, DC motor can achieve a quiet and smooth operation of this feature, it is also used for the precision operation of the robot is required. （7）. If you need special management, Kindly contact us for more information >>.